Generously, the company representative handed me the wheel of the new 34-foot American Tug, obviously not anticipating what would happen next. Adventurously, I jammed the throttle to the stop, listened to the 370hp Cummins engine spin up to maximum speed and cranked the wheel hard to port. A southerly wind of 15 to 20 knots was blowing the length of Skagit Bay, rolling up sharp 2- and 3-foot seas that were tumbling over each other in their northward race. Wind and sea conditions were not dangerous, but one did need to pay attention. At first the weather was behind us. As the bow swung left, I began to have some second thoughts; the small yacht was hit abeam by seas angling in from the southwest that seemingly wanted to roll her rails under. Surprisingly, the 34 didn&apos;t play that game, but held steady as the bow continued around until we were heading directly into the oncoming waves. At 18 knots we sliced through and over the waves, tossing hissing clouds of spray past the North Sea-style pilothouse and through an open window to the right of the helm. The boat held fast and firm to our course. While helping mop up the mess, it became clear that this was a stylish, well-built and extraordinarily stable small cruiser. Considering her nautical heritage, that&apos;s what one would expect. 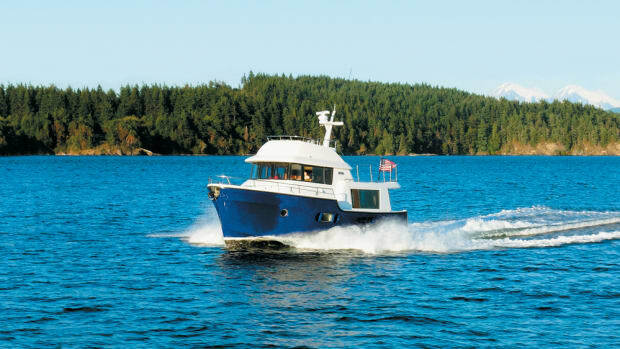 The American Tug 34, built by Tomco Marine Group, Inc., in LaConner, Washington, is based on an Alaska fishing boat hull designed in the early 1980s by Lynn Senour, a Seattle designer noted for a family of fast, efficient, ocean-going sportfishing yachts and trawler cruisers. To get commercial fishermen out to sea and back home quickly, Senour designed a boat with a waterline length of almost 33 feet and a beam of 13 feet 3 inches, which makes her an unusually beamy yacht. To increase the stability inherent in that beam and to further reduce roll, Senour added a flat, sharp chine where the V-hull meets the waterline. The result was a fishing boat that could carry big loads and, with sufficient horsepower, scoot to fishing grounds and back to port. The hard chine contributes to a safe and stable ride through the often-stormy waters of southeast Alaska. All boats will roll, yaw and pitch in heavy seas/the dynamics of strong winds and swollen seas make it so/and this American Tug yacht is no exception. 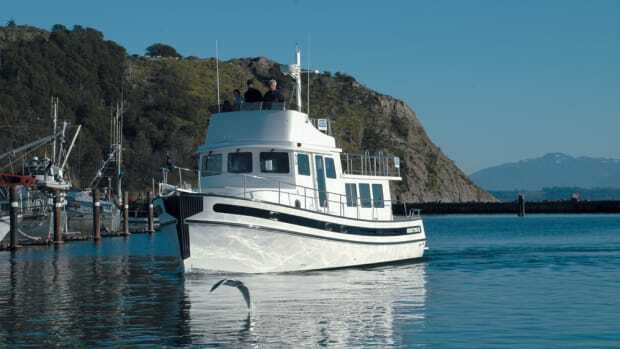 The Senour design, the wide beam, hard chine and the slightly rounded fish-boat stern tame those conditions, however, and it&apos;s obvious that design features that work for fishermen also work well for recreational boaters. American Tugs have seen far worse seas. Visits to southeast Alaska are common each summer and three AT boats/dubbed the Rainbow Fleet/went to Alaska last year immediately after launching in LaConner and then cruised south along the West Coast, passed through the Panama Canal and headed for Florida and then north along the East Coast. Those three experienced occasional huge seas and strong winds and were bounced around, but all reached their destination safely. The first American Tug 34 was launched in August 2000, the result of a little luck, an immense amount of boatbuilding talent and unbelievably hard work. Months before, Tom Nelson had headed for active semiretirement after nearly 40 years of boat construction in western Washington. Friends and associates urged him to consider building another yacht, and he turned to two friends and associates: Mike Schoppert, an expert in lofting, toolmaking and fiberglass lamination from years of work at Uniflite and Tollycraft, and Kurt Dilworth, a seasoned and successful engineer with a résumé that included university-level engineering study and work for other boatbuilders, including Chambers Craft and Premier Boats. They debated the issue and talked with Senour about design. Senour, a longtime friend and former associate of Nelson&apos;s, remembered the fishboat project of the &apos;80s. "He heard the mold still was in existence, and we found it in LaConner," Nelson explains. "Then we decided, yeah, that&apos;s going to work and started engineering and design of a boat that would fit that hull," Nelson remembers. Nelson, Schoppert and Dilworth organized the boat company and found an empty building near the waterfront in historic and picturesque LaConner. They built the molds and tooling for the deckhouse and interior, working intolerably long hours to get the first boat into production in time for fall and winter boat shows. The American Tug/which looks less like a tug than any other tug yacht/caught on quickly. The LaConner shop now launches a new 34 every 15 working days, or 17 boats a year. On my visit to the builder, the company&apos;s 50th boat was almost ready to go into the water, and the hull of No. 54 was under construction. 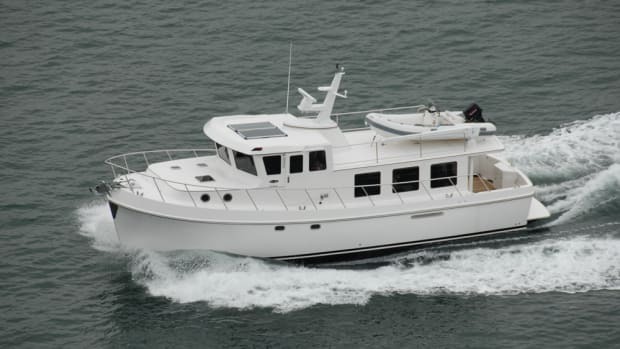 Although this is a Pacific Northwest boat, both in style and place of construction, the company has sold most of the AT34s to buyers on the East Coast. There are about a dozen in the Northwest, enough that they are becoming common sightings but still so unusual they draw visitors every time one pulls into a marina or fuel dock. A year from now there&apos;ll be another American Tug to admire: a 41-foot pilothouse coastal cruiser. On my visit to the plant, workers wearing moon suits and breathing masks were fine-sanding the plug for the hull mold. Because the plug was upside down, it offered an opportunity to see Senour&apos;s hull design and the chine that contributes so much to its stability at sea. Some yacht makers hire outside firms to build molds, but American Tug&apos;s carpenters built the plug on the shop floor. Although computers are used extensively in AT design work, Nelson, Schoppert and Dilworth lofted the 41 hull themselves on a huge wooden floor. Every component was drawn to size to provide patterns for the carpenters. Lofting is such a precise and proven technique, I&apos;m told, experts can predict boat performance just by studying those drawn lines. AT workers were just about ready to use the plug to lay up the mold, which will be used to create the boat hull. The first 41 is scheduled to be launched in September 2004. Although buyers have had only drawings to examine, the company has sold seven of the 41s, several to current 34 owners. In four years of production, AT has made about 100 changes in the 34. Nelson says most are out of sight. One exception: The builder turned to AJR Windows, Ltd., of Port Coquitlam, British Columbia, for a new series of stout doors and windows. The aluminum doors, with full-length glass center panels, have the usual door latches, plus top and bottom dogs that secure the pilothouse and saloon doors against the worst weather. "This is really a neat design," Nelson says about the small yacht. "The 34 has exceeded what we expected it to do. And Lynn Senour has grown our 34 to 41 feet. The ratios are the same, except for a few minor changes." Translation: Look for another performer. The easiest way to board the 34 is to step down to the swim platform and then up through the transom door to the cockpit. Most American Tugs carry an inflatable dinghy on an electrically powered, stainless steel davit mounted on the platform, and when it is pulled in and locked in place, the transom door is blocked. Release the davit slightly, however, and a pathway opens across the platform. Long-legged people might board over the cockpit bulwark. A dock step would make that easier, too. The sundeck could be used as a dinghy pad with the addition of an upper level hoist. But hanging an inflatable from the swim platform davit frees that upper deck for other important uses: storing crab and prawn pots, extra fenders and lines, a second freezer, and whatever else won&apos;t fit in available storage space. Or for grabbing some rays. A drawback in using the swim platform davit is that it makes the boat several feet longer, and mooring fees may be higher. Despite that, most buyers prefer the platform dinghy mount. The cockpit has space for several people to work lines or fetch items stored in the lazarette, but not for lounge chairs and tables. A ladder leads to the sundeck and the heavy hinged door opens to the saloon. It latches open, so there&apos;s little chance of it swinging shut unexpectedly. The 34 has narrow side decks, without bulwarks or guard rails, between the cockpit and pilothouse doors. But American Tug has added wonderfully stout stainless steel grab rails on the deckhouse to make that passage safer. Forward of the pilothouse, stainless rails provide protection for crew working on the foredeck. Step through the handsome AJR door and into the galley saloon. The galley is to the right, arrayed along the after bulkhead, the starboard side and the wall between the galley and the pilothouse. A corner sink is molded into the manmade stone countertop; the galley stove is in the center with a great view to starboard. On air-conditioned boats the stove is electric; on boats with diesel furnaces it is a propane stove. A refrigeratorfreezer is in the back wall of the pilothouse. The long, L-shaped galley counter will accommodate both a cook and a helper (or two) when major meals are planned. Many larger boats aren&apos;t that generous with galley space. Just inside the doorway on the port side is a large locker fitted beneath the window. I opened a door and saw a huge void that quickly could become a tangle of stuff. Another shelf would make it more useful, in my opinion. American Tug will install a combo washer-dryer in that space, which would be a good option for people planning on extended cruising and living aboard. A settee covered in Ultraleather is along the port side of the saloon. It hides an enormous amount of storage space and opens up as a double bed. With only one private stateroom forward, the 34 really is a boat for a couple who might infrequently invite special friends (or grandchildren) for a weekend. The saloon, pilothouse and stateroom are carpeted. The single head has a teak-and-holly sole. American Tug uses perfectly fit and finished teak wood and veneers throughout the interior, but there is no wood outside. Foam-backed vinyl panels line the ceiling throughout the boat. Some sections are held in place with Velcro to provide easy access to wiring runs if additional equipment is added. The first thing I look for when boarding a new boat is for something to grab if a sea or wake hits hard while we&apos;re under way. There are plenty of grab rails inside and out on the AT34, of both stainless steel and teak. One of the best placed-overhead in the saloon-offers convenient and safe support for anyone moving forward and up to the pilothouse. Other handholds are in the pilothouse, in the stairway to the stateroom and head, along the edge of the housetop, and near all doorways. The navigation lights are mounted on the forward corners of the pilothouse and might look like something to grab while moving aft in a lurching boat. I found myself reaching for one but pulled back, fearing my 190 pounds would pull it free. I was told no one has reported breaking one in a moment of confusion over its use. One of the most intriguing design elements on the AT34 is above the steps from the saloon to the pilothouse. There&apos;s a huge scoop cut into the ceiling over the stairs to keep people from banging their heads as they follow the steps while moving forward or aft. The scoop flows upward into what is the vestigial smoke stack every tug yacht should have. At the top is a clear plastic plate, which turns the fake stack and scoop into a skylight. Seen from the outside, the stack is much less dramatic, almost invisible. Without the scoop, the nice lines of the deckhouse would need significant alteration to permit passage from pilothouse to saloon without the danger of a rap on the head. In the pilothouse, the helm is to starboard, with an adjustable built-in seat for the helmsman. In all ways, this is a right-hand boat. Like many singleengine boats, the AT34 has a left-turning propeller that backs the boat to the right. Working on that side of the boat, the skipper can watch his landings and help with lines, if necessary. That combination makes the bow thruster almost superfluous. Doors open from both sides, and there are plush seats for several visitors. Nelson and crew believe in paper charts and provide a drawer that will hold dozens of charts folded in half. The helm area has space to open charts for true navigational work. All of the engine instruments, and radar, depth sounder and plotter, are directly in front of the helm. The instruments are mounted in a matte black laminate. The flat surface of the helm is a mottled brown laminate. The colors and patterns are attractive and guarantee there will be no annoying reflections. On the demonstration boat, the owner had chosen a Raymarine electronics package with 7-inch displays for radar and plotter. I proposed moving engine instruments overhead or to the side because we don&apos;t need to stare at them full time and because sensors will report a hot engine or low oil pressure long before the skipper would notice. I suggested using that space for bigger display screens, such as a daylight-viewable flat panel monitor. I learned that American Tug has done just that on previous boats. Because of the popularity of computer navigation, American Tug installs a cable carrying GPS data right to the spot where a laptop would be parked. Visibility is excellent from the helm. On many boats a short person needs a box to stand tall enough to see over the compass or the bow-a first-class safety risk. But not on this tug yacht. "I&apos;m a short person, and I designed it so I can see," Kurt Dilworth reports. The engine room is reached through two hatches in the pilothouse sole. Work will be conducted while kneeling or sitting, but with the single Cummins dead center above the keel access is good to both sides of the engine and batteries, a generator, furnace and other gear. Storage is provided beneath the settees and in the steps to the outside doors. A second key lock set into the helm area intrigued me. The explanation: The VacuFlush toilet in the head flows only into the 45-gallon holding tank, and to prevent inadvertent and illegal pumping overboard of tank contents, the pump switch has a key lock. Careful, don&apos;t lose the key! Forward and down a stairway on the port side of the pilothouse are the stateroom and head. AT has squeezed an island double bed into the forward stateroom, plus a hanging locker and other cabinets and storage spaces. The head has a roomy shower stall, bought off the shelf from a builder&apos;s supply and modified slightly for use on a boat. The head/there is only one/has doors from the stairway and the stateroom, offering privacy. The standard engine on the 34 is the 330hp Cummins. A 370hp is available as an upgrade option. At 9 knots fuel burn drops to 3.9 gph, according to American Tug underway testing. At 10 knots, fuel use averages 5.1 gph. Skippers like the extra burst of speed, despite the added cost, when faced with reaching a destination with risky weather on the way or for quickly crossing a waterway known to switch from calm to extra rough without warning. The trouble with going fast is that it is addictive and fun. Slow to an economical yet effective speed, and it feels like the boat has stopped. The difference in fuel consumption is so great, however, that it wouldn&apos;t take long to love 9 knots. Because of Senour&apos;s hull design, the AT34 handles equally well at either end of the speed range. At wide-open throttle the noise level in the pilothouse, directly above the 370hp engine, is 79 decibels, according to company measurements. Prolonged exposure to that much noise is tiring, and it makes conversation difficult. However, at 9 knots the noise level drops to 67 decibels, which is not much worse than your living room. At 10 knots, the reading is 73, still good. David Scott of American Tug Sales was driving the 34 at about 18 knots on a second trip to Skagit Bay and suggested opening the engine-room hatch. I did, and a burst of sound akin to an orchestra of rock crushers or a fleet of railway locomotives at full throttle flooded the pilothouse. That five-second blast emphasized how much extreme noise can hurt, and how effective insulation can be. On that day the bay was calm, and at full speed the 34 could have been running on tracks. We slowed for a couple of kayaks and it felt like we had stopped. The American Tug 41, to be launched a year from now, will have two staterooms (one of which may be finished as an office with a single berth) and two heads. Its standard engine will be a 480hp electronically controlled Cummins diesel capable of cruising the boat at 14 knots and giving it a WOT speed of 18. At 10 knots, 650 gallons of fuel will offer a cruising range of 1,000 nautical miles, the company predicts. "Having that kind of speed is important to people who want the capability of 14 or 15 knots to make crossings during good weather windows," Nelson explains. "There will be a lot of 10-knot cruising, probably," he adds. Like her little sister, she will be beamy: 15 feet 10 inches. She will have the same hull shape and stabilizing chine as the 34, so performance at sea should be similar. "She will be very stable," Nelson promises. Capable of sleeping seven, owners will be able to invite several friends for longer trips. Or a fishing enthusiast may fill it with his buddies for an angler&apos;s holiday. The 41 also will feature full walkaround side decks with boarding gates. Like the 34, she will have a bow thruster. Initially, American Tug hopes to build six of the bigger boats a year. Eventually, plans are to launch a 41 every 30 calendar days. The company expanded its plant earlier this year to provide space for production of the 41. American Tugs are delivered well equipped, including air conditioning for East Coast boats and diesel furnaces for those in service in the Northwest. The basic remaining decisions for a buyer are to choose an electronics package and a dinghy. The 41, with loads of additional space, will offer buyers more options, including a dishwasher and a washer-dryer. Dilworth says the new yacht will have an interior with traditional trawler features, including teak trim. "But it won&apos;t have the glitz of the all-fabric boats, like the Europeans and Bayliners," he adds. AT yachts are easy to identify, aside from the hint of a smoke stack and the slight reverse rake to the windscreen. Many of the boats have darkcolored hulls, with red, blue, green and burgundy popular today. In the past dark-colored surfaces were susceptible to rapid oxidation. Better finishes reduce that likelihood today, and several coats of wax will help keep the deep luster, too. The 34 sells for about $320,000. Pricing isn&apos;t firm on the 41, but it probably will be in the vicinity of $525,000. American Tug faces some strong competition in the market but seems to be doing well, indicating strong public support for traditionallooking boats that perform well whether going fast or not so fast. AT has a crew of about 50 men and women building boats. Some are lifelong boat people; others are enjoying a second career, while a number of youngsters are just starting out. Some speak only Spanish, but the company emphasizes that they need to know English to advance, and it provides classes for those workers. I&apos;ve been in the American Tug plant a halfdozen times and always sensed an almost-family atmosphere in which everyone seemed to be having a good time-even those doing physically demanding sanding and buffing. Pride in work well done is evident, too. Three American Tug 34s, with only a few hours on their engines, pulled away from LaConner, Washington, in June 2002. About a year later and with nearly 10,000 miles under their keels, the trio reached home in Florida. How about that for a shakedown cruise? The boats/Annie, Brown Eyes and Alyssa/first headed a long way north, taking the Inside Passage through British Columbia to Skagway, Alaska. Full of salmon, halibut and Dungeness crab, the adventurers turned south. Alyssa with his wife, Judy. They are from Fort Lauderdale. Crewing Brown Eyes were Greg Clark and his wife, Monica. He&apos;s the American Tug dealer in Jupiter, Florida. Because of the boat colors- red, blue and yellow-the American Tugs quickly were dubbed the Rainbow Fleet. The Boyles bought their boat from Clark, who also was ordering one. The Gordons signed on, too. "We decided to take delivery on the West Coast and to do Alaska," Chris explains. "Then we got ambitious and decided to go to San Diego. And then we said, &apos;Let&apos;s go all the way home.&apos;"
The fleet spent the late fall and early winter months in Oxnard, California, while their crews headed home for family and business reasons. In December, they shoved off again to spend Christmas in Mexico. All three were not together all of the time, but usually two were together and the whereabouts of the third was known to the others. Cruising the open sea in a 34-foot boat sounds risky and a little scary, doesn&apos;t it? The tug yachts ran 12 to 15 miles offshore along the West Coast and as much as 120 miles offshore in the Caribbean, where they were mere peanuts on the sea and far from help if it were needed. "We had two significant storms in which the boat was put to test," Chris remembers. "There was a point of concern in rough conditions, with 12-foot seas and 50-knot winds. But the boat kept going where I wanted." Leaving the Panama Canal, Chris and Judy Boyle hoped to make a 1,000-mile run toward Honduras. They were hit by a big storm and ran through it for 24 hours in search of calmer conditions. "It was in the middle of the night," Chris says. "You&apos;d go up and you could feel there was nothing under us and then the boat would come down with an almighty bang. I put her on autopilot and let it do its job. "She tracked beautifully, and wasn&apos;t squirrelly. It was too dark for us to steer, and we&apos;d always have been 15 or 20 degrees off course when we came off a wave, so we just hunkered down and counted the hours," he says. "There was no sense of foreboding. We felt the boat was working hard but that it would get us there." But what Chris and Judy remember best are the fine days spent in southeast Alaska and the good times exploring communities in Mexico and Central America. &apos;Awesome&apos; is the appropriate description for cruising southeast Alaska," Chris says. "We got close to glaciers, we saw black bears and grizzly bears and we caught Dungeness crab until I thought I couldn&apos;t eat any more. "We caught salmon and we caught halibut. We had gray, miserable days and then it would clear and be 75 degrees and there would be no boats. We were in a wilderness." There is a price to pay in cruising to Alaska, Chris says. "You work hard to get there." An experienced sailor, Chris remembers days spent in an open cockpit in foul weather. "Now, when I&apos;m going down the ICW or passing a sailboat in Alaska where it&apos;s wet and freezing I open the door (on my warm, dry tug yacht) and say &apos;Good morning!&apos; It&apos;s a delightful pleasure." The fleet spent Christmas 2002 in La Paz, Mexico, where they hoisted piÃ±atas on their boats and strung festive lights to share in the community&apos;s celebration. It was fun and memorable. "The Mexican people are delightful, hard working and very honest. We never had a hostile incident," Chris reports. On their way to the Panama Canal, Chris deliberately ran Alyssa to 6° 59&apos; North "So I could be the first American Tug to go south of 7 degrees." The fleet experienced a few minor generator problems, "but we had zero things to complain about. All the way, there was not a serious issue, mechanical or otherwise," he says. Alyssa, named after the Boyles&apos; first granddaughter, arrived home after eight months of cruising, with about 9,600 miles and 1,178 engine hours in the logbook. Would they make the trip again? They probably would not duplicate the Rainbow Fleet journey, because Chris and Judy felt rushed by the need to get home ahead of hurricanes and were disappointed they didn&apos;t have more time to explore inland areas of Central America. Next time, they will stretch the trip over two or three years, Chris says. And they want to do Alaska again. The question to be answered: Do they turn Alyssa around and take her back to Alaska? Or do they sell her and buy another American Tug with delivery in LaConner? Either way, it sounds like the beginning of another great adventure.